It has now been nine months since I joined the Good Life Orphanage family, I thank God for bringing us this far in providing care to our GLO children and also needy children in the surrounding area. I also thank the Members of staff at GLO for their support, they have been very co-operative especially the care givers taking care of the special children. Without the engagement and commitment of three parties (child, therapist and the caregiver), it becomes a challenge to meet the treatment goals. Thankfully during my time here at The GLO I have had the expert guidance of Nima, Diane & Donna who have dealt with my many questions and queries. 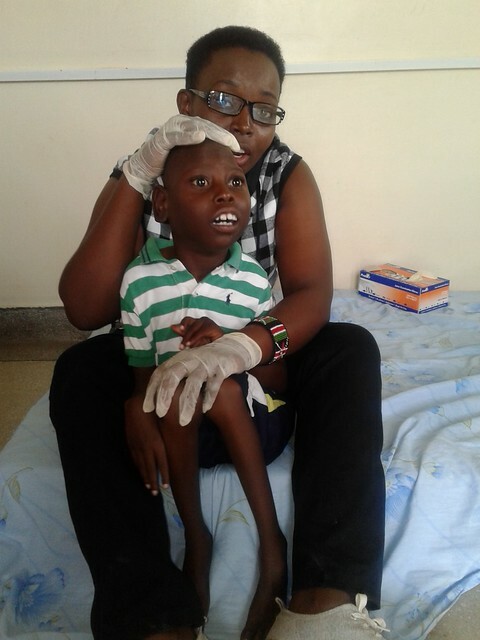 When the department started, we were offering our services to only the special children living at GLO but now we have expanded by introducing a new program for the out-patients, these are special needs children who live in abject poverty and cannot access proper treatment for their children. Although it has only been a short space of time I can say there is great improvement in some of our special children. Michelle who you will all know started therapy sessions with myself in November last year, she was not independent in feeding but nowadays she feeds herself. 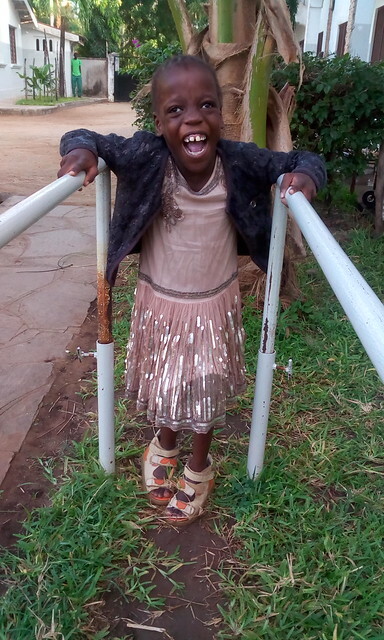 Michelle could not sit in an upright position due to her severe Cerebral Palsy but now sits well unaided and in January 2017 joined KG1 at SBM School, an unbelievable achievement for a child who was given no hope when she was born. She is also trying to bear some weight standing, holding on to something but before she could not stand apart from when she used the standing aid. Our medical outreach programme is also flourishing with our clients being very impressed by the services they are now receiving at our orphanage for free. Some have been coming along with their neighbours to witness the types of services we are offering and are spreading the word to other needy families in the surrounding area. 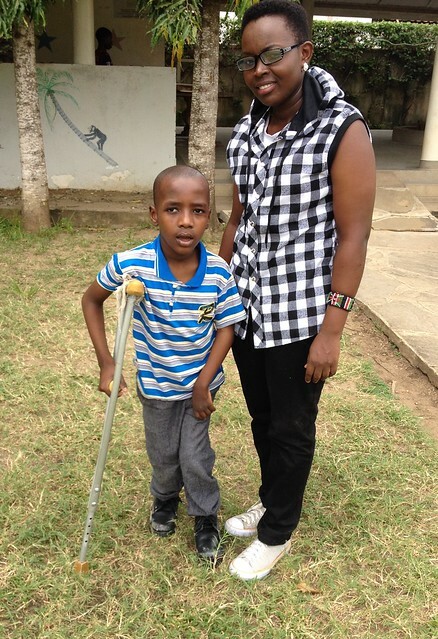 Mama Mary & Papa Kevin have been supporting a young autistic boy called George with the assistance if very generous donors from Manchester, George lives in Kilifi some 40km from The GLO with his Mama Nyevu who is very dedicated to the boy but also very poor. 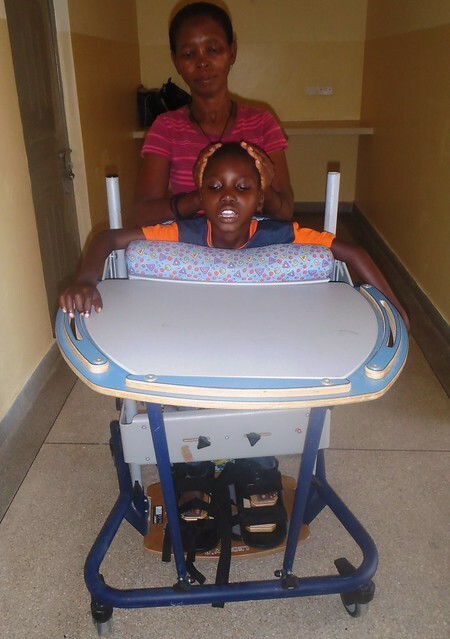 They now come to attend therapy session for three days every month, this allows George to have one to one session whilst his Mama can enjoy some time chatting to our caregivers, resting and getting three nutritious meals each day. When he started therapy he could not stand but so far he is pulling to stand. He was very hyperactive before and could not cope very well during therapy sessions but nowadays he is very responsive & can stand on a standing aid without much hyperactivity. It is still very early to expect very great changes but the little step every special child has made is an indication that our services are benefitting both our special children at GLO and the very needy outside GLO. We are looking forward to expanding our services so we can cover the needs of the community by purchasing more therapy equipments. We appreciate the endless support we have been getting from different people who share similar compassions for special needs children, together we can make a lasting difference to children who are usually hidden away from prying eyes due to their disabilities. Wow. Such progress. You are so right ,Winfred, that it takes the three strands all working together to make progress. I am in awe and very proud of all your hard work. Keep going everyone !